DoorStorm Ultra and DoorStorm MAX! 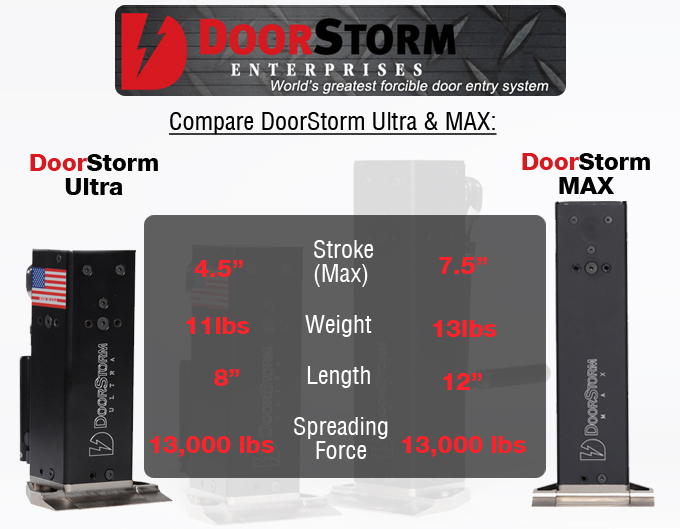 "World's Fastest, Lightest & Quietest Forcible Door Entry Device"
The DoorStorm units are manufactured completely in the USA in our own facilities and all components of DoorStorm Ultra and DoorStorm MAX are 100% precision hand-crafted. Both units are mechanical, light-weight, hand-held (by a single operator) and capable of opening a multitude of variously constructed locked doors, including, but not limited to, hollow core doors, solid core doors, aluminum doors, steel doors, bolted doors, deadbolt locked doors and push bar steel doors. They deliver in excess of 13,000lbs of spreading force with minimum effort. In most cases, the door is still functional after forcible entry is achieved. The DoorStorm units were developed to gain access to structures when normal means of access are locked, blocked or non-existent. They contain no hydraulics, pneumatics, oils, seals, priming fluids or hose lines. The units are operable in any orientation, including inverted, for generating substantial door opening excessive force - pull force, as well as enormous push force. The units are engineered with heat-treated, aircraft quality, austenitic steels in order to preserve the products' long life and durability. The units' moving parts are coated with an advanced, specially designed, inert lubricant facilitating ease of operation. The units have great versatility and can be utilized in many areas. Both units can be used as a jacking or door-wedging device which prevents access to or exiting a room, and can be used by law enforcement agencies in hostage situations. Quiet entry when necessary for stealth operation. DoorStorm units never need priming or monthly maintenance. Our systems have unlimited shelf life and are always ready for instant service when called upon - 24/7. The units are designed to operate in the harshest, most extreme environments ranging from below zero degrees to 312 degrees Fahrenheit. Both units are water and rust resistant. Cognizant of the environment, DoorStorm Enterprises builds its units environmentally friendly or "Green". The door entry process is designed to be totally inert - no oils or "O" ring blow-outs which can culminate in the spillage of toxic chemicals or fumes ceasing unit operation at critical times. 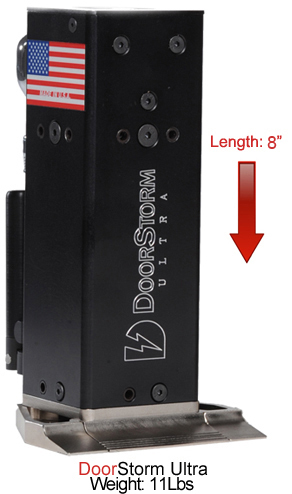 DoorStorm units feature a new Vanadium, high-stress steel expandable mechanical ratchet and cranking system which is unavailable in any other system and will increase torque as much as 17 times when extended. DoorStorm Ultra and DoorStorm MAX units provide major advantages over current, antiquated technologies. No hoses or seals - No priming or exercising!